Rachel J Homes is pleased to market this End Terrace House ideally situated in the popular Weston Village and close to schools, shops, amenities and transport links via M5, Rail and Bus routes. If you are a First Time Buyer or an Investor make sure this is on your list to view. 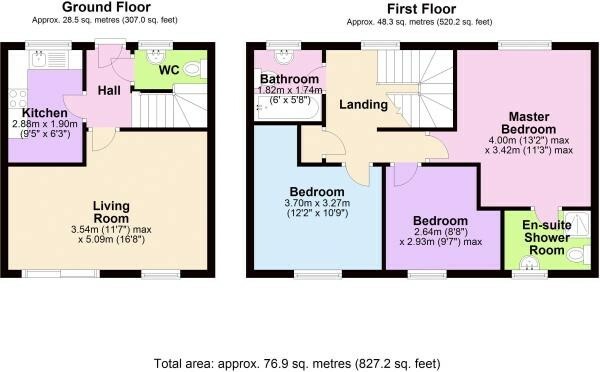 The accommodation briefly comprises of Entrance Hall, Down stairs WC, Lounge, Kitchen/Diner, Three Bedrooms, Master with Ensuite, Family Bathroom, Front and Rear Garden, Garage and Driveway. Added benefits of this property include double glazing and gas central heating plus there is no onward chain. Accompanied viewings - CALL NOW!! Composite entrance door into hallway, stairs to first floor, coved ceiling, doors off. UPVC Double glazed window to front, low level W/C, pedestal wash hand basin set into vanity unit hand basin, radiator. UPVC Double glazed window to front, range of wall and base units with work surface over and tiled splash back, wall mounted boiler, one and half bowl sink and drainer, built-in gas hob with extractor over and electric oven under-stairs cupboard, space for washing machine and fridge freezer, radiator. UPVC Double glazed window and patio doors to rear, coved ceiling, two radiators, T.V point, telephone point. UPVC Double glazed window to front, coved ceiling, radiator, storage cupboard housing water tank, loft hatch, doors off. UPVC Double glazed window to rear, shower cubicle with hot water shower, low level W/C, pedestal wash hand basin, radiator, part tiled walls. UPVC Double glazed window to rear, coved ceiling, radiator, T.V point. UPVC Double glazed window to front, panel bath with hot water mixer shower over, pedestal wash hand basin, low level W/C, radiator, part tiled walls. Enclosed by fence, laid mainly to lawn with patio area, side gate.